Sturdy, ingeniously designed, and capable of transporting a round layer cake, a pie or tart, hors d'oeuvres, or sandwiches, Tupperware's round Cake Taker goes to a birthday party or picnic in style--or keeps sweets fresh on the counter. Key to the Cake Taker's versatility is its reversible tray. One side is flat and has a slightly raised rolled edge so a cake can easily slide onto it but still be sliced without impediment. The other side is recessed to hold other foods and prevent them from moving around. The cover locks onto the tray securely with tabs that insert into slots on the tray and are held in place by sliding clips. The handle is built into the cover and doesn't wobble. Handles on the tray's sides ensure it can be carried securely for serving. 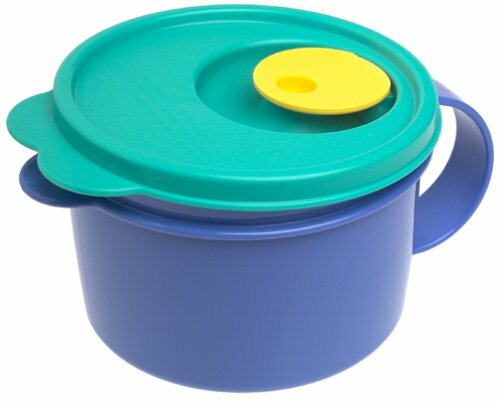 I am not a Tupperware fanatic or anything, I just have a few pieces, and this one is my favorite! It is great for taking pies and cakes to parties, and easy to clean. I recommend getting the little round blue tray that Tupperware makes to fit into this particular item -- it converts the Cake Taker into two levels, making it easy to take two pies, or two levels of cupcakes, etc. I don't know if Amazon carries it but it is well worth the money, as is the Cake Taker! This is a great caketaker and sarha has helped me alot. she is very promt and has a great heart. i will definitly buy from her again. 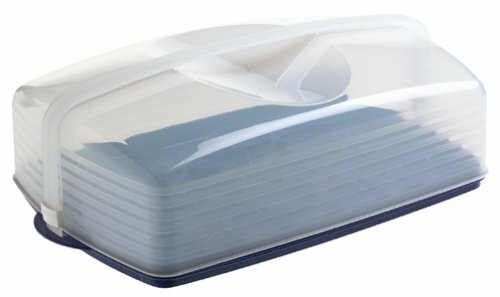 I have a cheap-o cake carrier that I bought a ... and now that I have this one, I know why Tupperware has been around so long. It's just good stuff and worth the money. It's smartly designed and durable. This is very useful to have. It can hold large cakes as well as regular cakes. I like the Rectangle Cake Taker too! Sturdy, ingeniously designed, and capable of transporting a 9-by-13-inch cake or 18 cupcakes, Tupperware's rectangular Cake Taker goes to a birthday party or picnic in style--or keeps sweets fresh on the counter. Key to the Cake Taker's versatility is its reversible tray. One side is flat and has a slightly raised rolled edge so a cake can easily slide onto it but still be sliced without impediment. The other side has 18 raised circles to hold standard-size cupcakes (2-1/4-inch-diameter bottoms) and prevent them from moving around. The cover locks onto the tray securely with tabs that insert into the slots on the tray and are held in place by sliding clips. The handle is built into the cover and doesn't wobble. Handles on the tray's ends ensure it can be carried securely for serving. Seller provided excellent service. The item was well packed, in brand new condition, and was shipped promptly. If you have a young child and you send them to school with cupcakes, this is the best carrier that you could have. I'm a novice baker but I love decorating the goodies that I make so that they are extra appealing. The problem prior to this purchase was that when I would make and decorate my cupcakes, they would get ruined in transit as I did not have the right equipment to transport them. This Tupperware "cupcake taker" changed all of that for me as it holds 18 cupcakes inside individual shallow cup holders so that they don't touch and therefore stay nice. Additionally, the "cupcake taker" bottom can be turned over so that it can be used to transport a sheet cake. This is a great purchase and although it may seem a bit pricey over $[...], it is worth every penny. In 2000 I took cake classes and looked all over for cake takers I could only find cake covers or glass cake domes but no actual latching takers until I found Tupperware. I have all of them! Thank you Tupperware for great quality product! My favorite use for this is to create egg sandwiches. Spray the insides with non-stick spray. Crack open 2 eggs and whip, add seasonings, garlic, pepper, etc. Microwave for 2 minutes with the vent cap open. The result is a perfectly round and thick egg patty for use on English Muffin or hamburger bun. Add a little bit of cheese, and you have a nice and quick sandwich for breakfast. 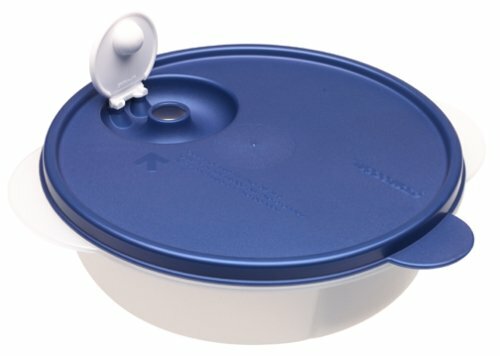 i love tupperware in general, but i particularly love the ones with the vented seals. they prevent splatters and i think everyone who works in a place that has a microwave oven should be required to have one---if youve ever noticed how some people dont wipe up their splatters! and this particular piece, i love because it is the perfect size for leftovers or soup. i'd like to see some better colors. and i would even like to see it in the clear hard plastic, like the square ones. i recommend this product very highly. I tend to take leftovers to work for lunch, and these mugs are perfect for that. The size is not too small, not too large. 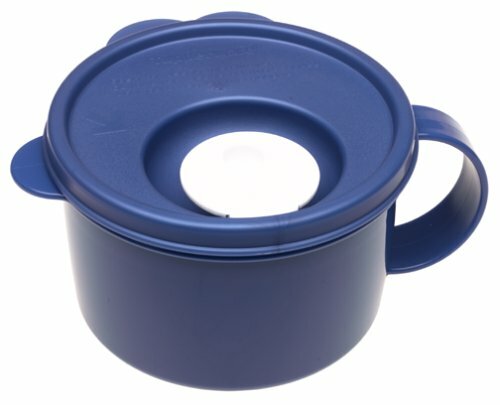 The handle is sturdy and lets me carry my nice hot food all the way from the microwave to my desk with no hot fingers. The lid and steam vent seal tightly, and having that steam vent feature is great -- I don't have to try to press a hot lid back over steaming hot food. These containers are well designed, and I use them so often I think I need to order a couple more! It's more than just a soup mug. 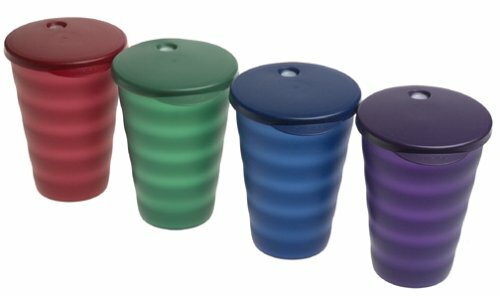 Colorful to behold, the four 16-ounce tumblers in this set come with seals that have drip-resistant valves through which straws can be inserted. The valves are marvels. Permanently affixed to the seals so they're child-safe, the valves flex to fit tightly around any size straw and prevent spills and snap shut when straws are removed--again preventing spills. That makes the tumblers terrific for the outdoors (seals keep the bugs out), for children at the dinner table, and for travel (the tumblers' 2-1/4-inch-diameter bottoms fit most vehicle cup holders). The tumblers can also be used without the seals. They're made of rigid, rugged plastic and have stylish, tapered, wavy exteriors to ensure a secure grip even when wet. Interiors are glass smooth for easy cleaning. I bought these off of my sister who sells tupperware, they're great for a lot of things. My 3 year old nephew loves them because you can fill the cup without the worry of whether the contents will be spilt. They're also great for taking in the car because as you're driving you don't have to worry about opening a bottle or taking your eyes off the road because the hole allows for a straw. Overall I would recomend these cups to everyone. When our daughters started to get tsk-tsk-tsk from their dentist, it was time to ditch the juice boxes for lunches. But what, to replace it with? Bottled water at 50 cents a pop? Sippy cups to make them feel 3-years old again? 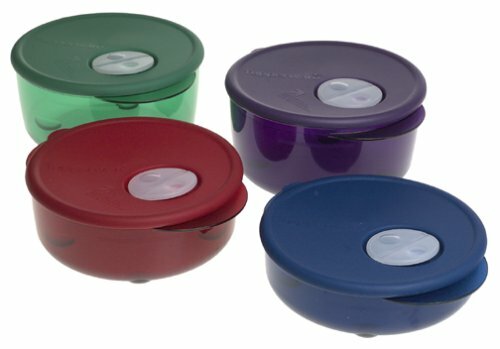 These Tupperware cups are great for school lunches and in the car. They are big, and won't easily fit in a metal lunch box. Instead, we found soft-sided lunch bags which nicely fit a lunch plus the Tupperware cups (Hello Kitty brand, with a built-in thermos we quickly ditched). Day one, the girls thought they were being downgraded to sippy cups, but with a cool straw everyday they now like and enjoy their water cups. Highly recommended for elementary school kids. A bit expensive, but worth it. My son is 18 months old and has successfully used these cups for the past 6 months. They are BY FAR the best cups we have- they do not spill! I wish I had not purchased so many sippy cups, because they can't compete with these. If you have kids, you can't go wrong with these cups. And, I don't work for Tupperware. I bought these and about $250.00 more of other Tupperware for Christmas. It was my once every 5 year stock up on the stuff. And, these cups were my first reason for placing the order and my most fulfilled request. They are great for me because of the spill-proof lid. My kids are 4 and 5. They go straight for these cups when they need to get their own drink. They haven't commented on them are asked me when did we get them, but no other cup is a choice now for them. And for me, no more spills. The straw opening on the lid makes the lid useful, thus eliminating the possibility of loosing the lid after it is removed. The lid becomes a mechanical and necessary part of the cup and is never misplaced because you are always looking for it. Unlike a simple lid for a cup which when removed could be placed down and then forgotten, this lid serves a purpose. The 16 oz size makes the cup great for adults too. And, I didn't order two sets with this order. But, I am re-ordering the additional set because I can see the backyard barbeque use for this summer. I also got the snack plates. I find the additional money for tupperware, worth it. Because they are a heavier product and they stack in the cabinet better. And, they never break. Now, you might lose a piece (and cry profusely) or there's the occasional one that takes legs and walks from your house. But, with minimal care they hardly ever damage. Many will not spend the extra money for Tupperware, but these are the cheap people. Because, if you give them a piece as a gift, they accept with open arms. I lose the tops to many of my alternative brands and can't understand why. Maybe its because they don't seal as tight and therefore the tops become less important to me. Whereas, you always mate your Tupperware tops back up after clean-up because you treasure the purpose that they serve so well. Tupperware and some of those disposable Gladware or Ziploc ware should be the staple in everyone's kitchen. The disposables will give others something else to steal without all the guilt. I was so excited when I found these round keepers. I was planning to pack a daily salad for lunch at work. I should have investigated the design more closely before making a purchase. The bottom half of the container (where you put the item you are storing) is very shallow. If you want to pack a salad, plan on packing a very small side salad. If you try to pack anything bigger, you will have lettuce falling overboard as you eat. I would just flip in over, but the top is not flat, and therefore does not have good footing. This is a great concept. They just should have put the deep half on the bottom instead of the top. Thanks Tupperware - No More Smushed Sandwiches! Leave it to tupperware to come up with the perfect solution for my sesame seed bun sandwiches! Even plastic baggies weren't this easy. 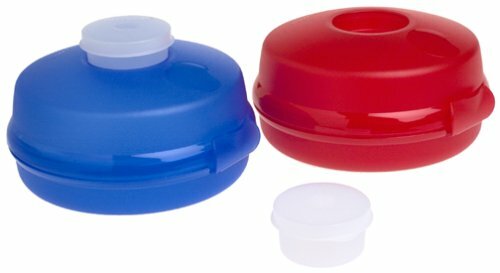 My (1)red and (1)blue round sandwich keeper set hold my sandwiches perfectly, and even keep them fresh! Before I took them in sandwich bags and they got smashed! The ease of opening these couldnt be any better. Want to take a salad? Well this works great just for that. Fill the round sandwich keeper with your salad, and fill the smidget (small white lidded container that stores on top) with a dressing, or cheese perhaps? I can add yet another tupperware item to my list of enjoyable, useful purchases! Strength, Look and durability of stainless! 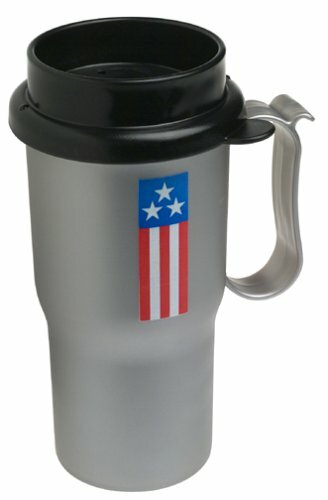 This tough plastic drink mug is plenty durable. It can stand up to even the toughest abuse, or commute. I really love not only the lightness (even when filled) but the spill-proof as well! No one likes having hot coffee tumble out onto their work clothes, or legs for that matter. 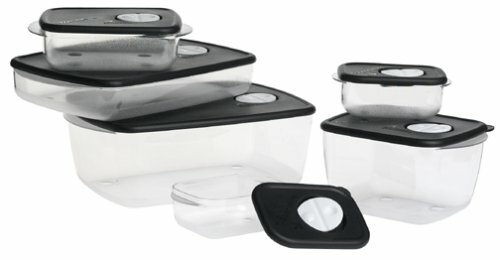 The six rugged plastic containers in this set are freezer- andmicrowave-safe, so you can use them to freeze cooked-in-advance mealsand then reheat them (although they're not intended for microwavecooking). Each container is topped by one of Tupperware's legendaryseals--virtually airtight and leak-proof. Built into each seal is aRock 'n' Seal valve. Push one end and it pops open to vent steam in themicrowave, while the seal remains tight to prevent splattering. Thecontainers' feet ensure maximum air circulation for quick, uniformfreezing and reheating of contents, and the containers stack forcompact storage. I am not at all happy with the square and rectangular lids, these lids become damaged in the corners. The others are excellent, the smallest one portion, and the round container. I am very impressed with this set of Tupperware. My favorite feature of the set is it's versatility. I frequently freeze food in it and it has no problem going straight from the freezer to the microwave to the dishwasher. It is very resilient to stains (even tomato stains) and nearly impervious to odor entrapment. The only reasons that I gave the set four stars instead of five are the rather excessive price of the set compared to competitors and the almost total lack of usefulness of the very smallest size container (currently holding screws in my toolbox as I can't imagine what food product would fit inside it...maybe one Hershey's kiss...) Other than these minor points, I am happy with the set and would certainly buy it again despite the onerous price. Tupperware is the best. It is expensive, but so worth it. I still have some lime green and orange tupperware in my cabinets that I use. These rock and seals are great. From freezer to microwave - no problem. Well worth the money. These really work. Make a normal recipe for 4 or 6 servings, eat 2 and freeze the rest. Next week grab a frozen one, zap it and you are in business. Solves the problem of cutting down recipes to serve just 2 people as well as saving time cooking future meals. Just bought a second set. This product was bought to handle all the "leftovers" that my wife has me carry back from dining out. She loves that the product can go from freezer to fridge to microwave to dishwasher - she even uses them as serving dishes or "plates" when time is running short. Recently, my wife designated the smallest container for laundry detergent, and I couldn't be happier. For two years, we have been leaving a "detergent trail" from our apartment to the laundromat. Those days are over....we now have a compact detergent holder that can withstand falling three flights of stairs, is air tight so if it drops in the washer there's no "gloppy" mess, and it can withstand being run-over by our van. This is a perfect size for lunches. The cold cup concept is definitely an innovation, because in the past, you had to keep a separate container for your cold items. Now, you just pop up the vent on the lid, and nuke the container, provided you remove the cold cup if you're using it. However, it works equally well without the cup, if you want three hot courses for your meal. The only minus is that you don't want to put very liquidy items in this container, unless you are keeping it level while you're travelling. 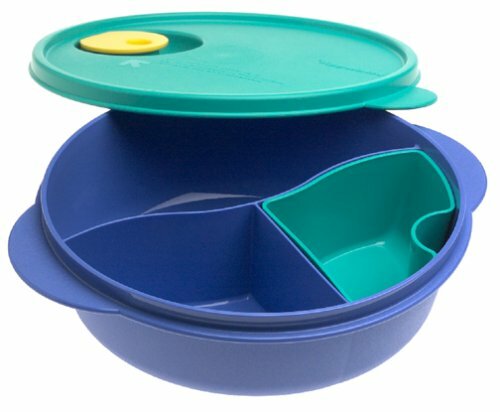 The lid does not seal each individual compartment, nor would it, to get full advantage from the Tupperware venting system. Much better than the low cost versions..
After many years of buying the cheap versions of separated lunch plates...and having the contents spill all over, not to mention having to take a cold item separate. I splurged on this. What can I say? Its great. It costs more than the cheap copy-cats but I know that I wont find my lunch all over the bag when i go to eat...I dont have to take an extra container for a salad or dessert... And I know I will have it for years.